UGI’s primary community efforts are devoted to improving the quality of the public school system. Our deepest commitment lies in our over 27-year partnership with Reading Is Fundamental (RIF). The program provides more than 50,000 books to more than 18,000 first-grade students each year. UGI has distributed more than 1 million books to first graders throughout our service area, which spans the state of Pennsylvania and parts of Maryland. We actively encourage the participation of employees by promoting the programs internally and by enabling employees to volunteer their time (and ours) at schools, libraries and book distribution events. UGI’s ageless and all-knowing “Reading Wizard” makes reading come alive through the power of his books. 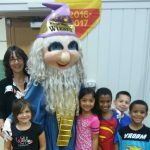 The Wizard makes guest appearances at book distributions in elementary schools throughout UGI’s service territory. He also has appeared at book fairs, libraries and similar literacy-oriented activities and has been greeted with excitement and enthusiasm by children, teachers and administrators. Download The Reading Wizard coloring book. UGI was honored with RIF’s 2011 Legacy of Literacy award for outstanding commitment to children’s literacy. UGI has also been recognized for its commitment to education improvement by the Points of Light Foundation, the National Association of Regulatory Utility Commissioners, the American Gas Association, and state and local organizations.